So, I’ve been wondering what to write about. See, I’ve been on vacation for a week and getting back into things is hard, huh? Anyway, Cyrus, my best but Bad dog, got lost and I tapped into the first point in a lost dog e-network for the first time. Wait. Let me tell the story, then we’ll talk about the ideas that came out of it. On the last day of vacation, Tim took Cyrus for a walk. The two dogs had already been treating him as if he were the substitute teacher while he house sat, but as a dedicated substitute, he decided that for this walk he would use the retractable leashes because it seemed much more fun for them. There were deer at the top of the driveway and when Tim came over the hill, both dogs were OFF!!! They pulled him to one side and then the deer reversed directions. So did both dogs. Tim braced himself for the inevitable combined 100 pound of two deer-crazed dogs, only to have Cyrus’s retractable leash separate from the handle. And then Tim held desperately on to the cord as it ripped and burned through his hands. He said it hurt like hell, but he didn’t want to lose Cyrus on his watch. These hands look like he was sailing a very small boat in a very bad storm with deep burned cuts where the fingers bend. Cyrus was gone. Tim spent most of Saturday and a good part of Sunday, walking and calling out but to no avail. We came home and made posters and stakes and supports and went out to tape them all over the neighborhood. Tim posted a notice on Craig’s List and I sent one to a woman who runs a rescue email chain. Then other networks got the email and began to work their network. There are Facebook pages for lost dogs in Comal County. There are individuals who have their own emailing/call lists. Today I got a call from a woman at Man and Beast who wanted to know if we’d found Cyrus because she got a call from a woman who had found a border collie mix. 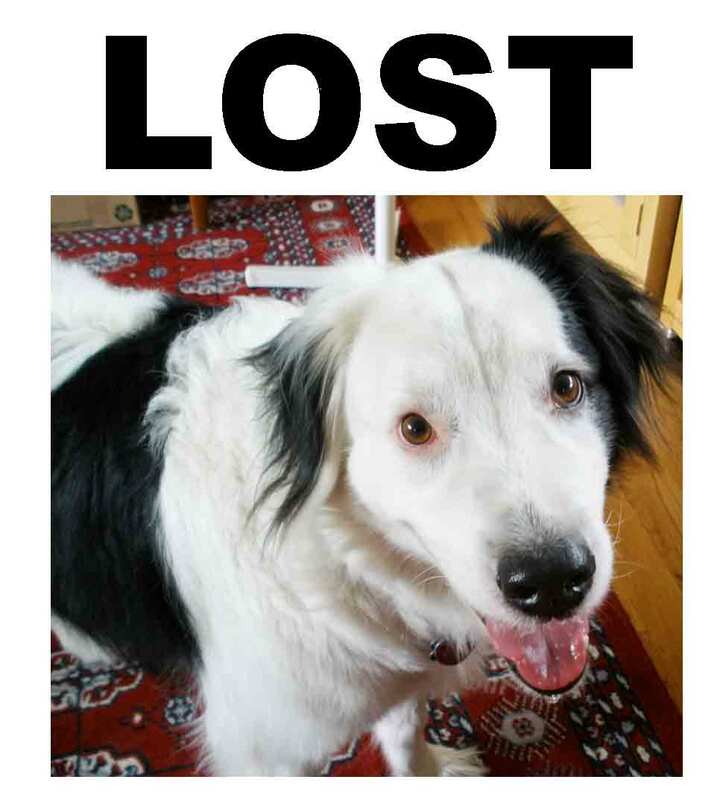 I HAD AN EMAIL ABOUT ANOTHER LOST BORDER COLLIE MIX!!! We exchanged phone numbers and I called the finder, leaving a message. Then I looked at my email. Another network had already responded to her with the appropriate poster. This is effective social media, with an emphasis on the social and less on the e-media. It’s a committed, loose collective of dog lovers. And many of the folks at the center are retired teachers (did you know I would work that substitute theme back in?) who remain committed to finding and caring for the lost. Dogs aren’t that much different from children in that way. It seems to me that the power of this social network and maybe all others is both the commitment and the point of intersection of the circles. Google + might manage to tap into the intersections of circles but there is no technology that can deliver commitment. That’s the social stuff. The rest is just media. Who’s in your network when you define it this way and what intersections do you sit in?